Frequency XC lenses are produced by CooperVision and are designed to correct lower levels of astigmatism. Their unique design ensures sharp vision under all conditions. 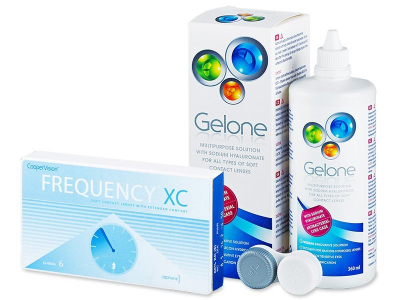 This economy package contains a 360 ml bottle of Gelone solution and an antibacterial lens case. FREQUENCY XC are aspheric contact lenses by CooperVision designed to correct lower levels of astigmatism. These lenses have a 30-day replacement schedule and are not suitable for continuous wear.